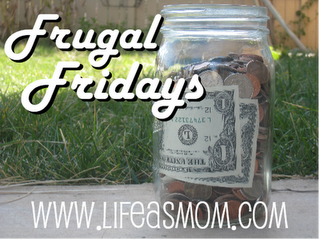 Everyone else is being Christmas-y in their posts, but for Frugal Fridays (hosted by Life as a Mom here), I'm getting into taxes and health costs. Nowhere near as much fun as how to create adorable presents at home... but as we approach the end of the year, this could be very important. Okay, if you have Flexible Spending Accounts set up through your/your spouse's benefits programs, do you know what your current balance is? If not, stop reading and go find out. Online, our account says we have $186.08 in our account. Now, if we do not incur another $186 in medical costs this year, we lose that money. I'm not into losing money, so I have plans to reduce that amount... and some of that may be tips for you in figuring out what to do with any balance you might have too. First, I know that I used my credit card yesterday to pay for vision appointments for myself and three of my kids, plus to pay the $20 balance for my other son's new glasses. That totalled $112, leaving me with $74.08. But that is tip #1: make sure that you have put through any and all medical appointments that you have paid out of pocket. And tip #2 is related also -- do you have some some things that aren't necessary, but would be nice, like having a child go in for a vision check in 1.5 years instead of the 2 that the doctor suggested? Second thing I am doing is to submit a claim to the company for mileage for the appointment we went to yesterday. You can claim $.24 per mile for the miles you drive to and from doctor appointments. That adds up fast for me, as I can submit $20.68 for yesterday. So that will leave me with a balance of $53.40. So that is tip #3: claim mileage for all your appointments in 2009. Go to Mapquest or Google Maps and do up a thing for each of your medical providers -- doctor, dentist, chiropractor, eye doctor... print out however many you need of each map, and then note the date, who had the appointment, round trip miles (using the number Mapquest gives you), and the total cost when multiplied by 0.24. Of course, you do need to look at your calendar and see if you have anything scheduled yet this month and factor that in as well. But what if you do get down to the point of having some money left, and no expected expenses? You don't necessarily have to lose that money. Could you go order a pair of prescription sunglasses? Can you refill a prescription in late December instead of early January? Are you nearly out of Tylenol or cough drops? Have you always thought having one of those itty bitty packages of Tums would be nice to have in your purse, but you couldn't rationalize the cost of the small sized package? Is one of you overdue for a physical, or a trip to the dentist? You might not be able to get an appointment scheduled, but then again, maybe you can. Just be careful with things like over the counter medications. You are not allowed to "stockpile" the medicines with your Flex Account funds... so if you go purchasing six bottles of Tylenol, that reimbursement really should be refused. Also, you can't deduct mileage for driving to Walgreens to pick up aspirin, so don't try that either. My kids are due for a trip to the dentist sometime this month, so I'm going to see if I can schedule that... which would mean another $20 or so in mileage, which gets me close. Now, for my family, one thing is that last year we drastically changed our medical coverage so we'd be paying less in premiums. So for our Flex Plan, I figured out what I thought we'd need, and added another $200 as a "self-insurance" of sorts. So if we get down to only having a few dollars left, I'm happy. So, now you can go read about inexpensive gifts and other holiday fare. I admit, that stuff is far more exciting! And it is where I'm going too. Well, after I call the dentist. I did a recent post about this, too - not just Flex plans, but reviewing health coverage, 401(k) plans, etc. We just used up our Flex plan last week! I didn't know you could buy OTC stuff on it unless it was "prescribed" by a doctor. I also didn't know about the mileage deduction, so I'm glad I came over here!